You probably shouldn’t have ordered the super-size fries. That’s what you were thinking after you finished the last of your double cheeseburger-add-bacon. When you ordered, fries sounded good – although maybe not so many. And your soda, well, the word “small” needs redefining. Nothing worse than cold fries, so you wadded them up with your sandwich wrapper, slurked the rest of your drink, and threw everything away. You’ll think twice about that next time, once you’ve read “The Last Hunger Season” by Roger Thurow. Andrew Youn is a man with seemingly unlimited energy. Journalist Roger Thurow met the “skinny, bespectacled … geek from Minnesota” during a snowstorm in Chicago, where Youn told Thurow about the farmers he’d met in Kenya in the early 2000s. Youn explained that Kenya’s use of ancient farming traditions led to wanjala (hunger time) and starvation because of lack of access to modern methods of planting. Youn, an MBA student, had been pondering this, and he had an idea. Thus as born One Acre, a non-profit program that helps sub-Saharan farmers reap higher yields from their shambas through education, seeds, and fertilizer. Thurow, who’d also seen poverty and starvation in Africa, was intrigued. He asked Youn if he might follow four farmers for a year, through wanjala and beyond. As a village elder, Leonida Wanyama needed to set a good example for others, which is why she joined One Acre. She was amazed the first year at the bounty she reaped, but it wasn’t enough. Her husband, Peter, was ill and their son, Gabriel was away at school. School was very expensive: $255 a year. Rasoa Wasike was so pleased with One Acre that she inspired several others to join. But that wasn’t Rosoa’s only endeavor; she was lucky to find other employment so her wanjala wasn’t quite so severe. Zipporah Bikiti had jeered at neighbors who used the One Acre methods, until she saw their lush, bountiful maize fields. She was determined that this wanjala – a particularly long, terrible one – would be her family’s last. Francis Mamati and his wife had a vision. They had three acres and their son, who owned a nearby café, had a small plot, too. A shamba like that, properly farmed, could create dreams. So why, you’re asking, should you read a book about a bunch of miniature farms half a world away? Maybe you won’t want to … but I was blown away by it. 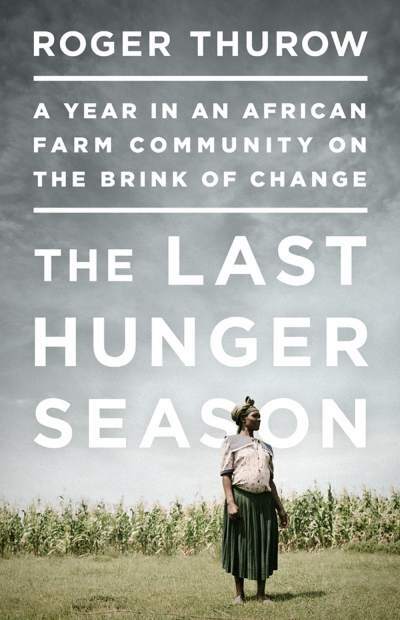 “The Last Hunger Season” is, indeed, about four Kenyan farmers and the last time each had little more than tea to feed their families from January through June. But in telling their stories, the politics behind fixing what’s wrong, and the triumph of success, author Roger Thurow also gives his readers a huge lesson in gratitude: chances are you have food, and this book never lets you forget that.